Set of Four (4) Slate Coasters. Complimentary Engraving on Slate Surface. Free Engraving! Three (3) initials or a monogram can be engraved, or choose your own personal message of up to four (4) lines of text. Enter information to be engraved using the personalization option during checkout. if ordered by 4:30 pm EDT Tuesday April 23rd. 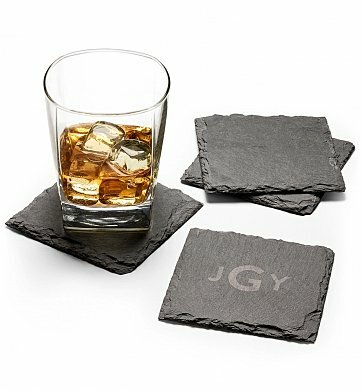 Personalized Slate Coasters is a hand delivered gift. These gifts are delivered by one of our local design centers located throughout the United States and Canada. Same day delivery is available for most gifts when ordered before the cutoff time. The cutoff time for Personalized Slate Coasters is 2 PM in the recipient's time zone. Set of four slate stone coasters with natural edges and velvet backing. Complimentary engraving on the slate coaster surface. I have not opened them because they are a gift, but the presentation is very nice and the added touch of a little extra gift with an elegant gift card was a very nice touch. I can't wait to give them to my son! I ordered some for my husband for Christmas and he loves them. So then I ordered some for some friends and they have already replaced their old ones with these. They work great with keeping water off of the table. I will order again when something catches my eye, such as the coasters. Excellent Service! Ordered these for my son's 30th birthday yesterday and they arrived as a big surprise to his office today. He loved them and also the Birthday Gift Treasure Box that was also ordered. A huge hit! He was totally surprised and everyone in the office was impressed. Loved the monogram and the look of the coasters. They were wrapped nicely even though they were not a gift. I had some discrepancies during my order and addressed it to the live chat assistant. She was able to help me and overlook the purchase and corrected where necessary. Superb and reliable customer service. Purchase arrived on time and according to recepients it is a very nice gift. Thank you very much. Bought these for my stepdad-He loved them!!!!! My husband loved these. It came personalized and very quickly. Packaging kept them safe from breaking. Thanks! I love these coasters. They're perfect for anyone who is into the Earth and enjoys natural art. I got these for my dad and he really liked them. They seem very versatile as if they could go with a variety of decors. Paring this item with the slate cutting board was an excellent idea, they complement each other well and make a complete package. Buyer and Recipient extremely pleased. High quality, speedy shipping, and a great guy gift. Will definitely shop at GiftTree again! My boyfriend has been searching for months to find appropriate coasters for our finished attic and that's when I came across these. They shipped out very quick and he absolutely loves them. The only drawback is the personalization didn't go through on the website but nonetheless the material and coasters are still a great gift. If you have a special occasion and don't what to send ..I highly recommend these beautiful costars I sent them for a 50th Anniversary and they got rave reviews. Excellent gift. My Girl in LA love these and thought they were so neat b/c I put her initial and her son and husband on the coaster and then. I talk my friend into getting one of our attorney the same gift b/c these are people who has everything. I have a great boss and work remote so finding a gift is a challenge. Wanted to give a personalized gift but didnt want the usual cheesy gifts. Hes tough and stylish so these personalized coaster were the perfect solution. The gift arrived on time as promised. I am very please and would definitely come back for more gift ideas.